Boyd Responda Flex 5062 6" Memory Foam Mattress, Great Budget minded mattress with good support. Certified eco-friendly foam manufacturing process reduces harmful VOCs from being released into the atmosphere. BOYD SPECIALTY SLEEP leader in the Industry since 1977. Manufacturer of high quality State-of-the-Art Specialty Sleep mattresses and accessories such as air beds, latex, memory foam, flotation, adjustable and platform bases and pillows. Our Eco-Friendly manufacturing is a Certified “Green” process that contains virtually all Volatile Organic Compounds (VOC’s) and prevents them from being released into the atmosphere. BOYD Memory Foam has an “open cell” breathable structure that promotes air flow and the dissipation of heat (warm air) which keeps you cool and comfortable all night long. Open cell Memory Foam contains billions of balloon-like cells with tiny air passages in and around them where air can escape when pressure is applied. When you lie down air escapes from the compressed cells and is spread to adjoining cells. The foam “melts” under you to provide long term contouring comfort and support. Open cell Memory Foam is highly permeable while still retaining the temperature sensitivity that makes Memory Foam uniquely conforming to the body. The open cell structure absorbs motion and reacts to the force being applied to it. Initially this may feel firm, but in seconds the contouring properties take effect and the mattress begins to absorb the weight placed upon it. For mor information on Adjusta-Flex® Lifestyle Foundation click on links below. 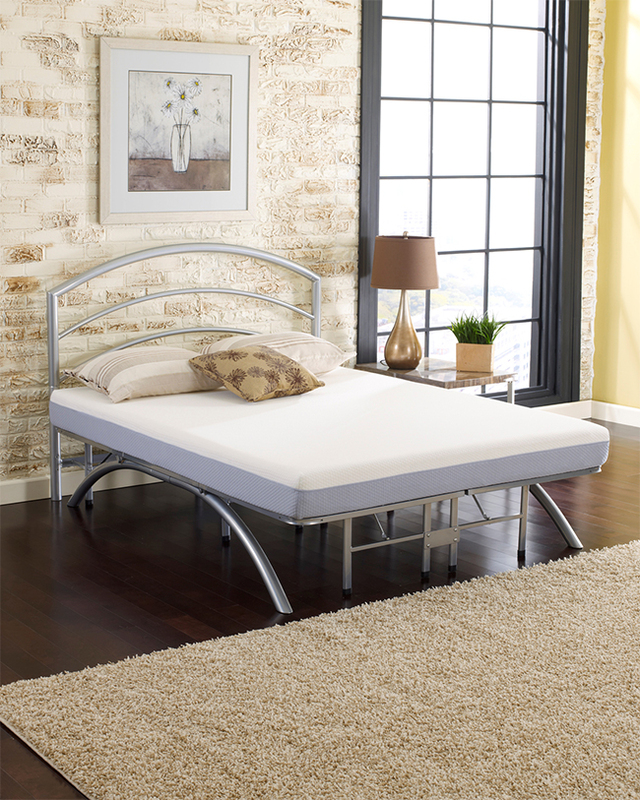 ► Place your new mattress directly on this heavy duty frame and experience all night comfort and support. ► 14" height provides ample room for under-bed storage. ► This frame can stand alone or be used in place of the slats (inside the side rails) of your current bed. ► Portable, compact size makes the frame easy to transport through even the narrowest of spaces, such as stairwells or elevators. ► 14'' frame height provides more under bed storage than a standard 6''-8'' metal frame. ► Heavy duty construction supports up to 1,200 lbs. and provides sag and squeak free mattress support. ► Easily assembles in minutes with no tools required. ► Fabric free black anodized coated 100% steel construction is free of dust mites and allergens. ► Optional small and large brackets allow a headboard and/or footboard to be bolted to the base. Custom fitted cover fits snuggly over the platform frame. Corner brackets Headboard/ Footboard Brackets ensure a smooth corner transition.